Citrine is a golden yellow stone in the Quartz family of minerals. Naturally yellow citrine is rarer than heated Amethyst, which turns gold when heated. You won't be able to look away from this unique pendant enhancer. White agate, blue turquoise, and citrine gemstones create the sunny combination in this pendant enhancer. The stones are adorned with Sterling Silver and brass oxidation in delicate detail. Wear it on a silver or gold chain for a traditional look, or a favorite cord for a more contemporary style. 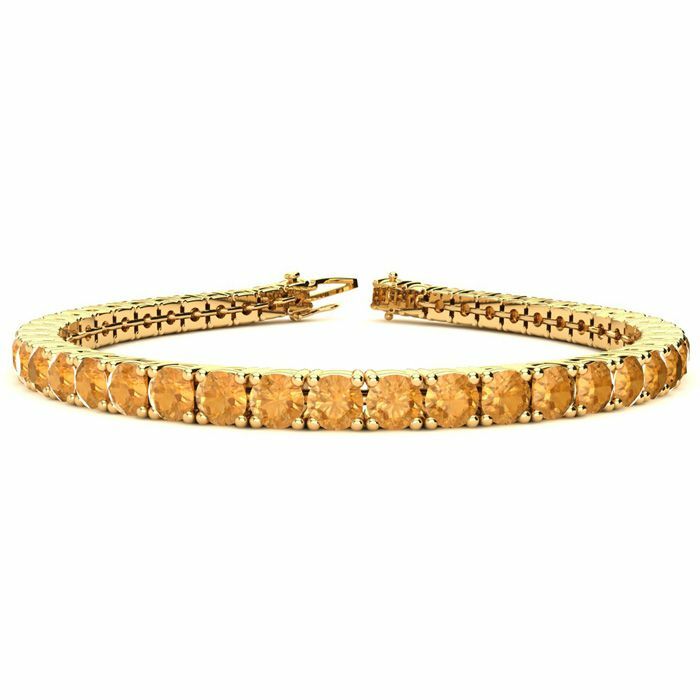 This classic gemstone bracelet features shimmering citrine gemstones. The 6 inch bracelet contains 39 gemstones at 7.80 carats. The 6.5 inch bracelet contains 43 gemstones at 8.60 carats. The 7 inch bracelet contains 46 gemstones at 9.20 carats. The 7.5 inch bracelet contains 49 gemstones at 9.80 carats. The 8 inch bracelet contains 53 gemstones at 10.60 carats. The 8.5 inch bracelet contains 56 gemstones at 11.20 carats. The 9 inch bracelet contains 59 gemstones at 11.80 carats. This bracelet is approximately 3.8mm wide and is crafted in 14 karat yellow gold. This bracelet has a secure, box with tongue and safety clasp.